Santa Barbara County is one of the unquestioned stars of California’s 2011 vintage. Freakish, highly unusual weather conditions produced a set of fragrant, resonant, beautifully delineated Chardonnays, Syrahs and Pinots loaded with class and pedigree. Overall, the 2011s have lower alcohols and higher acidities than California wine lovers have become accustomed to in recent years. Wine isn't made by numbers, though, and it is a mistake to give too much importance to analytical figures alone. The best 2011s are gorgeous, drop-dead wines that fully capture the personalities of Santa Barbara’s top sites. Readers who want to learn more about the vintage might enjoy these video interviews with Chad Melville and Paul Lato. The 2011 growing season got off to a rocky start. A severe frost in early April wreaked havoc on production by lowering yields dramatically, especially in the Sta. Rita Hills. Windy conditions during flowering made things even more difficult by reducing crop levels even further. 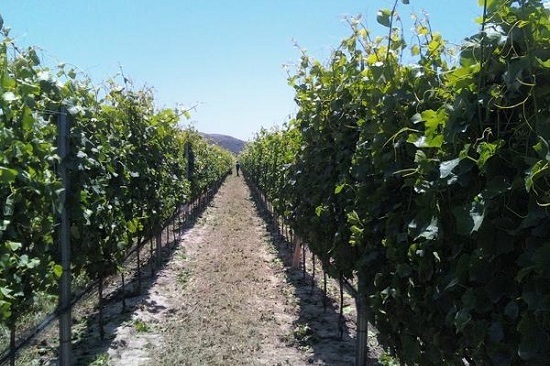 As always, it is hard to generalize about weather because events such as frost can devastate one vineyard and leave a neighboring parcel untouched, but overall, the spring and early summer were not kind to growers. Broadly speaking, yields are down a whopping 40-50%, the kind of numbers that give accountants ulcers. In retrospect, though, the low crop loads turned out to be a blessing in disguise. The remainder of the growing season was quite cool and wet; with no periods of any real heat whatsoever during the summer, but less rain than in northern California. A normal crop would have never ripened in 2011, but nature has a way of establishing balance, which is exactly what the frost and irregular flowering did. The harvest was delayed by a few weeks and stretched into November for Syrah, exceedingly late by any standard. Sugars and therefore potential alcohols were a full percentage point lower than normal, while acidities were correspondingly higher, but the reduced yields allowed quality minded growers to achieve fully developed flavors. The best 2011s show plenty of depth and stuffing allied to vibrant minerality. It is a style I personally find highly appealing. I am not alone, but more on that later. Now that I have tasted the 2011s in all of California’s major appellations, it is looking increasingly likely Santa Barbara County will turn out to be the most successful region within the state in this much misunderstood and wrongly maligned vintage. Once again, I was deeply impressed and frankly inspired by the risk taking, entrepreneurial spirit of the younger generation of winemakers who are driving so many of the new projects that are taking off in Santa Barbara and the Central Coast as a whole. Within Santa Barbara, 2011 is most consistent with Chardonnay, generally a hearty grape that was able to withstand the stresses of the year reasonably well. Readers will find a number of fabulous Chardonnays from all of the appellations in Santa Barbara County. The cooler conditions were also favorable for Sauvignon Blancs, most of which have been on the market since last year. In general, the Chardonnays from Santa Barbara have more depth than those of Sonoma, because the spring frost concentrated flavors to a greater degree than was the case farther north. Simply put, 2011 is a top-flight vintage for Santa Barbara Chardonnay. Among the reds, Syrah fared better than Pinot Noir and Grenache. The Syrah shoots were out slightly when the frost hit, so much of what was harvested was second-shoot fruit, where the crop loads are naturally lower than normal, but that became a positive as the cool year progressed for the reasons outlined above. The frost and poor flowering hit Pinot Noir much harder. Shatter was an issue in many spots. Most growers reported loose bunches and brutally low yields. A number of winemakers who tend to use whole clusters had to back off on the percentage of stems in 2011 because the proportion of stems to fruit was higher than ideal given the poor set. At the same time, I tasted a number of over-ripe, almost alcoholic Pinots, which will probably come as a surprise to readers. When vines carry low crop loads, sugars can spike very quickly as harvest approaches. In these cases, picking decisions are critical. I ran across a handful of Pinots that taste like they were harvested a little later than would have been optimal. In 2011, quality in Pinot Noir is all over the place, but the best wines are striking. Grenache, which is late to ripen and is sensitive to poor weather because of its thin skins, struggled through the adverse conditions of the year, although I did find a few terrific 2011 Grenaches. 2011: A Turning Point for California? At first, growers and winemakers were understandably quite worried about the 2011s. Most of them had never harvested fruit with such low sugars. Once winemakers began to taste their wines, many of them changed their minds as they realized flavors could be fully developed, even with lower sugars and alcohols. When vintage 2012 arrived, it was, on paper, a picture perfect California vintage in terms of weather. But as I have started tasting the 2012s from barrel, those wines don’t seem anywhere near as different stylistically from the 2011s as I would have expected given the totally different growing conditions. It is obviously much too early to form conclusive opinions, but I am very interested to see to what extent, 2011 (and 2010, to a lesser degree), have influenced the decisions producers make going forward, especially when it comes to Chardonnay, Pinot Noir and Syrah. Given that so many of California’s top producers are part of the younger generation, it is impossible not to recognize that for many of them their best work is probably yet to come. Needless to say, this is a very interesting time to be following the evolution of California wine. Much has been written about the 2011 vintage in California. I wonder how many people have actually tasted the 2011s throughout the entire state. Not too many, I suspect. Yes, it is an inconsistent vintage in some regions, but those who discard the wines without having tasted them are making a mistake, as there are a large number of surprisingly great wines in 2011 just waiting to be discovered. As an aside, I spent almost two weeks in Napa Valley during the 2011 harvest. The weather seemed to change every five minutes, wreaking havoc on picking dates and times. The early morning fog on the valley floor looked more like Piedmont than Napa Valley. I found far different conditions in the mountains, above the fog, where bright sunshine and warmer temperatures dried out the rains, especially in well-drained sites. While some winemakers were freaking out – and that is not an exaggeration – I could not help but notice that the French-trained oenologists I visited were completely unfazed by the conditions. A number of California winemakers told me 2011 was the toughest and most challenging vintage they had ever seen. I have no doubt that is true. I am equally convinced that the experience gained in this vintage will be a tremendous asset going forward. Readers should approach the 2011s with excitement, an open mind and an inquisitive palate. Yes, some level of selectivity is required, but this is a fabulous vintage in many parts of the state. Nowhere is that more true than in Santa Barbara, where the region’s top producers made a bevy of gorgeous, utterly breathtaking wines that will provide enormous pleasure for many years to come. I also tasted a number of dazzling 2010 reds this year, especially Pinots and Syrahs. Up until 2011, 2010 was the coldest year many winemakers had ever seen. A series of late season heat spikes pushed ripeness levels up, but left the wines with excellent acidities. Where growers de-leafed aggressively the results are mixed, however, as the intense heat literally scorched the fruit in some places. The best 2010 Pinots and Syrahs are ripe and juicy, yet have fabulous underlying minerality and tension. There is a sense of pure explosiveness in the top 2010 reds that makes them impossible to resist. As we were preparing this article for publication I had one last look at pricing, and was completely blown away. Prices for the best Santa Barbara (and Central Coast wines) remain exceedingly fair within a global context. And make no mistake about it; the Central Coast’s top estates are turning out wines that are every bit as outstanding as those from the world’s other premier regions. As I have done for the last two years, once again this year I am dividing Central Coast coverage into several smaller articles in order to give greater focus to each of the specific regions that make up this vast set of appellations that essentially spans just north of Los Angeles to just south of San Francisco. Articles on the Santa Cruz Mountains, Santa Lucia Highlands and Paso Robles will follow over the next few weeks. All of the wines in this article were tasted in May and June 2013.